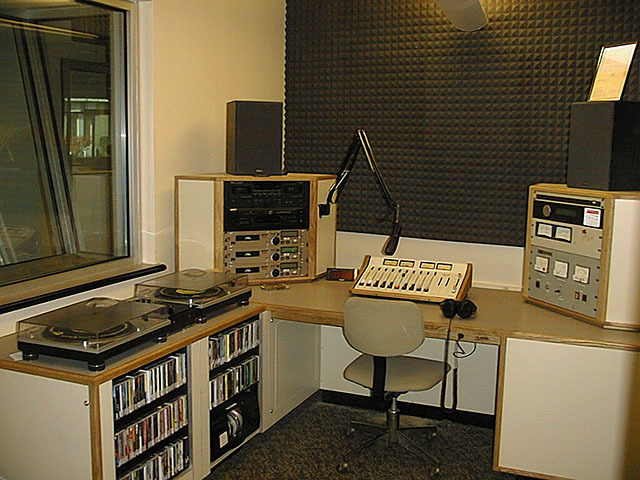 The WRKC air studio. Exterme left: Technics SL1200 turntables and the "DJ" mixer, below the turntables is CD storage for the current rotation and the 200 CD changer for overnight operation. Left pod contains from top to bottom a TEAC cassette machine, a Sony MXD-D3 mini disc player and, three Gemini CD-x601 CD Players. The compact 10 channel on air console allows room to add a computer monitor when the station goes to "music on hard drive" for overnight in the future. The right hand pod contains the EAS equipment, modulation monitor and transmitter remote control.